When December rolls around, I always think about my first novel, The Night Before Christmas. I began writing it in 1970 and published it in 2008. Recently, I was asked how many times I revised it. Truthfully, I lost count over the years. There were several times I thought it was finished, and then a new change came to mind. The characters, good and bad, are forever in my heart as well as my mind. There is Betty, a wife and mother, only 23 with three daughters and no skills to support them, so she decides to go back to an abusive husband. Then there is Wes, a husband and father, a man who loves his family, an alcoholic trying to stop drinking, a man of faith but lacking in understanding, a lack that puts him on a deadly path. Finally, there is Sadie, the strict grandmother who raised Wes in her fundamentalist church, the Church of Light, and prays for his salvation. Each has a point of view and a way of seeing things. Each has a hand in bringing about the crisis that threatens to destroy them all. Through December 31. The Night before Christmas, which is regularly $2.99 will be available on Amazon for 99 cents. It will also be available for 99 cents on Smashwords if you use the coupon code of QX62S at checkout. 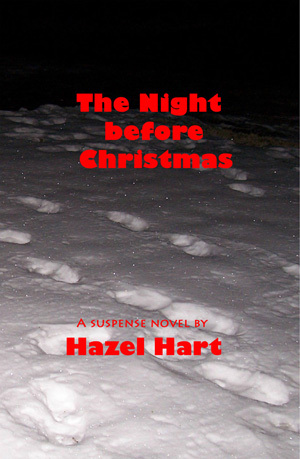 This entry was posted in Fiction Writing and tagged Hazel Hart, psychological suspense novel, The Night before Christmas. Bookmark the permalink.